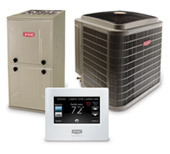 Boyle Heating, Cooling, and Plumbing has firm roots in its commercial operations. Since 1997 Mike Boyle has earned a reputation as a contractor who delivers on his promises and meets his commitments, characteristics that he has passed down to his team of HVAC and refrigeration professionals. If you’re looking for a trustworthy commercial HVAC or plumbing contractor in Peterborough and the surrounding regions, who can be really counted on, then Boyle Heating, Cooling, and Plumbing offers you a great option. Fair prices that offer good value, quality work that’s guaranteed to be done right, and professional uniformed staff – just some of the traits that you’ll find at Boyle Heating & Cooling. Contact Mike Boyle directly today to see if he and his team are the right fit for your business. Plenty of references are available upon request. Boyle Heating & Cooling has quickly become my preferred contractor for HVAC installation and repairs, as well as for plumbing work. They are not the cheapest on the market, but they are the definitely the most reliable, which is key. They also do the job right the first time around and I can count on them to quality assure their work, so for me and my business they offer the best value for any heating & cooling contractor in the Peterborough area.